This is Miss 18 Year Old’s bathroom. For the past ten months she was also sharing it with Our Swedish Daughter. When we moved in almost two years ago, we painted and that was about it. 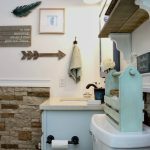 This past winter, I started to work on updating this bathroom by painting the sink with Giani Granite Kit, and painting the cabinet white. This past weekend, I finally got around to finishing up a couple more projects I had been planning. I took down the builder grade mirror and replaced it with a framed mirror, and I took down a very sorry looking cabinet over the toilet and replaced it with these DIY shelves. Here is a picture of what the bathroom looked like when all we had done was paint. I am very happy with the progress so far! I wanted to show you how I made the shelves today. Several months ago, I picked up these wooden magazine holders (I think that is what they were) at the Habitat for Humanity Restore for $1 each. I think they were from an old Science lab based on the stickers I found on the back. What do you think? I knew immediately when I looked at these that they would make awesome shelves for her bathroom! I could already picture it in my mind. So, they sat in my garage for a few months, and on Saturday morning, I decided to go for it and take down the old cabinet and mirror and force myself to get it done! So I spray painted them white. After going through three cans of white spray paint, I still was not liking the way they looked. It needed more coats, which I did not have on hand, so I busted out a can of white semigloss latex paint that was in the garage, and gave the outside one coat with it. That did the trick. The next day, after letting them dry overnight, I went about making them into shelves. This is the back of them. I didn’t paint the backs. I used these large keyhole hangers to hang them up on the wall. And I used these mending plates to attach the two pieces together. That made them secure. This is what they looked like after they were attached and ready to hang on the wall. Now, are you ready for the finished product? This did not happen without many frustrations. The screws that came with the drywall anchors (75 lb. anchors) we used did not match exactly with the keyhole hangers, they were too bulky, so we loosened the keyhole hangers just enough so that the screws would slide in and lock. And trying to get them onto the wall sucked. It took forever to hang these suckers! But we finally did it! When I took down the old cabinet and mirror, the walls needed touched up because those spots weren’t pink. Of course we had no paint left over, and I could not find the paint swatch, so I cut out a small square of the paint from a place where it wouldn’t be noticed, and took it to Home Depot, and they were able to color match it for me. That is a little trick that my neighbor, the professional painter, taught me. I asked for his advice because I didn’t know what to do, and he told me to do that. I just used a small utility knife and cut into the drywall enough to get the top layer of the paint off. And then I used some spackle to touch it up, and sanded it down when dry, and you can’t even tell where I did it. They aren’t styled exactly the way I want them, but I was using what I had. I am sure there will be some tweaking to make them look prettier, once I find what I want. After I had the first shelf finished I started on the middle shelf. I must not have had it hanging on the screw securely, and it collapsed as I was styling it. It knocked the bottom shelf down too, and broke a large jar full of cotton balls that I had sitting on the back of the toilet. NOT FUN! I was so frustrated by that point that I had to walk away. LC saved the day and cleaned it all up for me. And luckily, the screws did not rip out of the wall, and the shelves were not damaged at all. This red basket will be spray painted white as soon as I get around to it. I love the openings where the magazines would have went. Perfect for nail polish or washcloths, things of that nature. Overall, I am very happy with the way these shelves turned out. And they are a huge improvement over the disgusting cabinet that was there before. We had to hang them a little high because they do stick out from the wall. so I sat on the toilet, and LC figured out how high they needed to be so that someone could comfortably sit on the toilet without hitting the shelves. Genius! As I mentioned above, we also replaced the builder grade mirror with this framed mirror that I got from a friend who owns a consignment shop in town. I got three of these, and one larger one for very very cheap. I spray painted this with a metallic silver, but I am not happy with the color. It is just not shiny enough, so I will be taking this down and spraying it with something a little shinier. I wanted it to have a little bling. Instead it is slightly dull. But still much improved. And this is the jar of cotton balls I mentioned above. At least it is a replica of the one that was shattered in a million pieces. Luckily, I had another jar just like it. It was full of cotton, but also shards of glass, so I threw the cotton out, and will refill it later. I decided to put it on the sink instead of under the shelves, you know, just in case. And in case you were wondering, the sink is holding up well with the Giani Granite kit. I would say it has been about three months since I painted it. I also replaced the shower curtain rod and hangers with oil rubbed bronze ones. They were white. I like it better this way. I also hung some new wall art on this wall. Have any of you seen the Flea Market blog hop that Rain on a Tin Roof had going on? Well, I purchased this burlap canvas from one of the participants and framed it with the white frame from Target. Voila! something pretty to hang in here. You might remember this little bamboo stand that I spray painted and also the tissue box. And this, my friends, is my next project in this room. Replacing this floor. I kinda hate this linoleum with a passion. Update: The floor is done! Come see my floor reveal. This is a shot of the room after I painted the sink and cabinet. And this is what it looks like today. This is a difficult room to photograph, and no windows. And because everybody loves a good side by side, here are all three shots of the bathroom from the beginning until now. I would say I have come a long way, baby! Only two more projects and I can call this room done! New flooring and hang a light over the mirror. That will require an electrician, because right now, there is no light. All of this will be finished before school starts in the fall, I swear! It feels so good to be finally coming to an end in this room. It might just be the first room in our house that is totally finished! (for now- tee hee!) Today marks my last day of work until August 4th. Who wants to come over and share a bottle of wine?